Grab Healthy Sprout Maker With 3 Compartments only for Rs. 99 from Shopclues.com! This is a saving of 80% on printed price, since the printed price of Healthy Sprout Maker With 3 Compartments is Rs. 499. The perfect Kitchen companion at an unbeatable price. Introducing the revolutionary product .Now you can make sprouted pulses in a clean & hygienic way. Sprouted Grain-pulses-cereals are best food provider by nature. This sprout maker provides you with constant supply of sprouted food, full of nutritive value. It prepares sprouts in te most hygienic odourless convenient way and mimics nature’s process in a scientific way. It is made by 100% Food Grade Material. Its your faithful cook while you are on diet. It consists of Unique siphon system With Air And Humidity Control For Hygienic sprouting System and Making low calorie Salads. 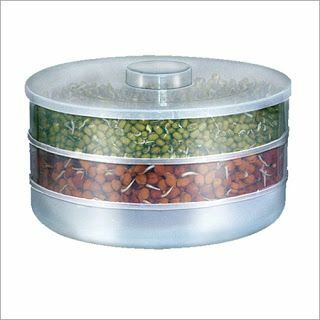 Scientifically Designed Containers facilitates easy and hygienic sprouting of Beans . Food grade transparent container with lid makes cooking comfortable and easy. This sprout maker has three bowls for three different beans. The sprout maker is manufactured using high grade food material to ensure durability and temperature resistance. Sprout Maker is manufactured to make cooking comfortable and easy. Sprout maker for preparation of sprouted food that is high in nutritive value. Goto this Healthy Sprout Maker With 3 Compartments at Shopclues.com. Apply this Shopclues.com Coupon Code: SC4SM99 and get 80% OFF. Thats it and you are 2-3 business days away from getting Healthy Sprout Maker With 3 Compartments in your hand! Saving Tips: Before checking out, do look for latest Shopclues.com Coupon Codes. This can give you further cash-offs and discount.